Like most things in this game, if you want something from someone you have to earn it. This time you must befriend Joe, the Assistant Carpenter. To do this is very simple, just give him an Egg every day for about a week. One day while you are down at Maple Lake you will enter a cinema where Joe is fishing. He will give you a Fishing Rod and teach you how to go fishing. To cast your rod, equip it and press the Square button when standing next to the lake. A dark spot in the water will indicate where a fish is, so just use the left analog stick and the X button to maneuver your bobber over to it. When the fish bites, you'll see directional arrows appear. 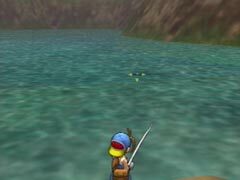 To reel in the fish just press the left-analog stick in the same direction the arrow is pointing and press the X button. There are certain times in the day in which your chances of catching fish will be greatest. Here is a list of those times below. The best place to fish is at Maple Lake, and you can move around to fish in different areas around the lake. You can only sell Medium and Large fish, but Small fish still has its uses. Small fish can be used for cooking up recipes, so don't always throw them back. The fish are typically Small sized in the Spring, Medium sized in the Summer/Fall and Large sized in the Winter.